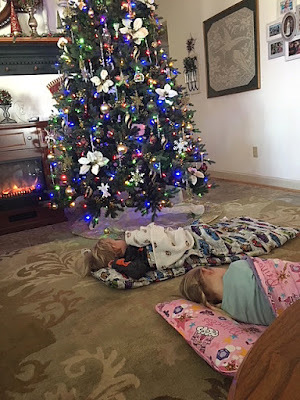 Wishing all my blog friends a very happy and blessed Christmas! This was our card this year which includes a photo from our vacation at Sandbridge Beach (near Virginia Beach) the end of June. The lighting isn't the greatest when you take a picture of a picture! L. to R.: Laura (daughter who is a traveling RN and currently in SanAntonio, TX), Mark (middle son), Cash (age 2), Quinn (age 4), Ashlie (Mark's wife), me, Don (DH), Matilda (age 2), Michael (oldest son), Jessica (Mike's wife). I wanted to share a card I created to thank a sweet couple who gifted me with a wonderful gift basket with items that were so useful following my mastectomy. I water colored on Ranger watercolor cardstock using Mijello Mission Gold paints. PAPER: Calm and Cozy Chevron 6x6 pad by My Favorite Things; White and Luxe Silver (PTI). DIES: Poinsettia and Pine (Altenew), Grateful Leaf (Concord and 9th). MISC. : Softly Falling embossing folder by SU. Happy hump day everyone! 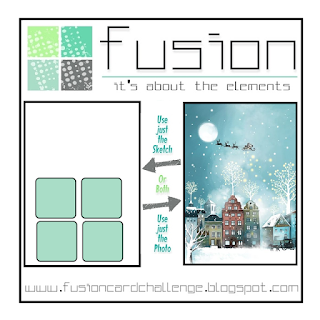 I don't have a Color Throwdown card since the challenge team is taking a break until the first of January. 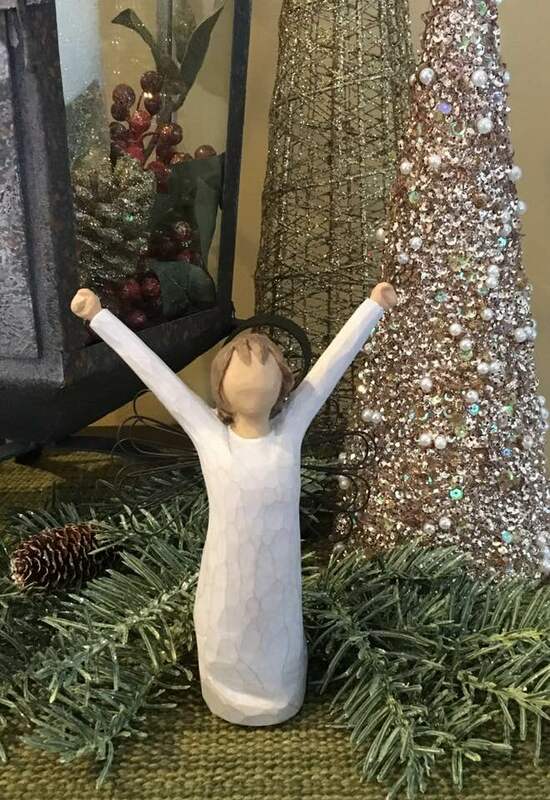 A friend on Facebook recently asked the paper crafting community to support a family in her church who is going through a difficult time right now. The mother/wife in the family was given two years to live and so any words of encouragement were asked to be shared. This sentiment is a "go to" sentiment when I want to send that type of card! It's by Reverse Confetti from a stamp set called "God is Good". The florals are also by the same company and the set is "Blooms 'n Buds". I water colored the base using Twisted Citron and Peacock Feathers distress inks on Ranger water color cardstock. 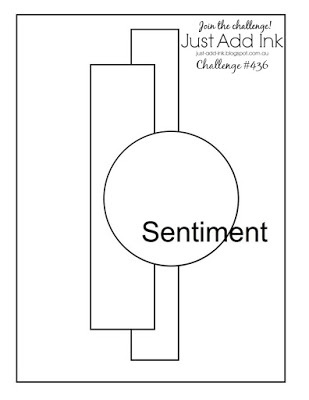 The sentiment was stamped three times using my MISTI with Versafine Onyx Black ink. The florals were stamped with inks by Reverse Confetti - Bumblebee Yellow, Piggy Bank, Magenta, Parakeet, Iced Aqua and Aqua. The Stitched Rectangle STAX die is by My Favorite Things. I kept two grands (ages two and four) all day and got this card done during their 2 1/2 hour nap! It's always a welcomed time of peace and quiet - LOL! Good Saturday morning everyone! Rain, rain and more rain until tomorrow morning! Water standing everywhere and just hope and pray there is no serious flooding going to happen! It's causing the 13" snow we got last Sunday to melt rather quickly. 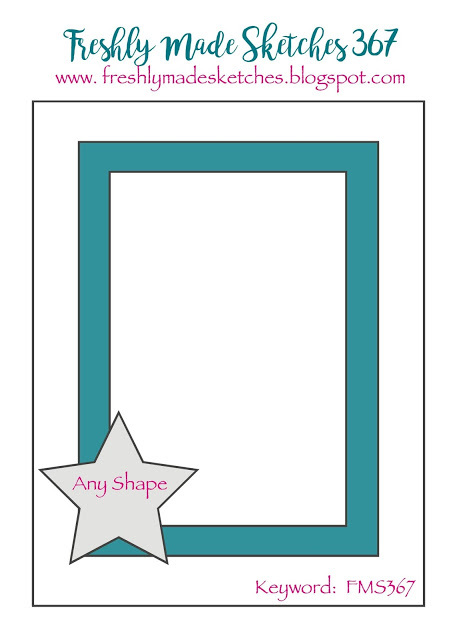 I made a quick card last evening for the current Freshly Made Sketches challenge. PAPER: Winter Solstice 6x6" pad by Reverse Confetti; Aqua (RC), Real Red (SU), Black Licorice (MFT), White (PTI), Brushed Silver (SU). DIES: Winter Words, Holly, Globe, All Framed Up - Reverse Confetti. 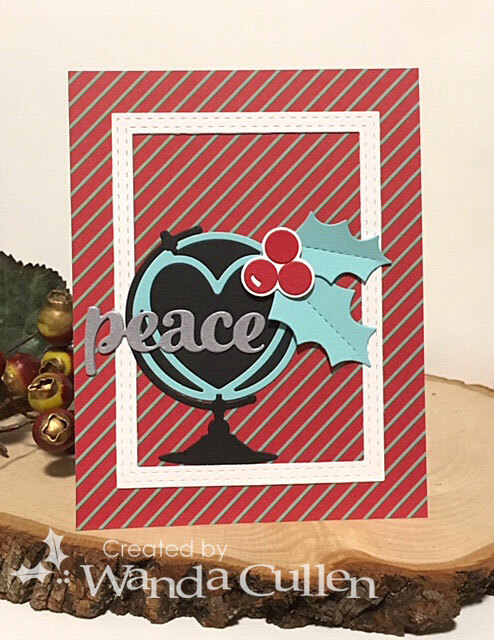 It's a dreary, rainy day in VA, but I'm lighting up my crafty space with this card that I created for a couple of challenges! 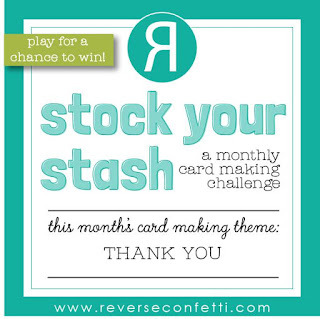 Reverse Confetti's Stock Your Stash Challenge for December has a theme of thanks. I was also inspired by the gorgeous photo for the The Card Concept Challenge. I love all of the silver with a wee pop of green, so I went with a CAS design and tried to capture the elegant holiday theme! card base. 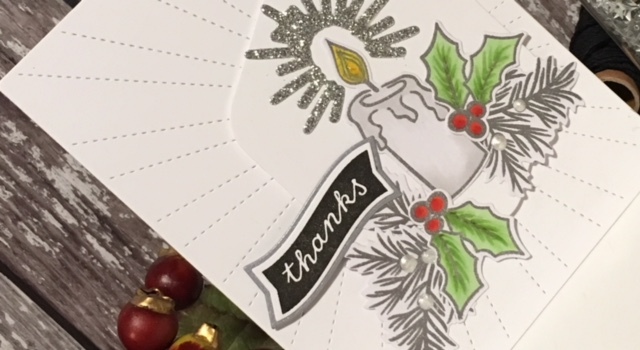 I then used the negative-spaced shape from RC's Hello and Thankful Label die for the background of the candle elements. I silver embossed the candle and greenery and added White Opal Liquid Pearls to create white berries. The holly and berry images were colored with Copics (YG11, YG13, YG17, R24, R27). The flame was colored with Y08 and Y35 then Crystal Ice Stickles were added for sparkle. STAMPS: Christmas Candles, Bitty Banners - Reverse Confetti. 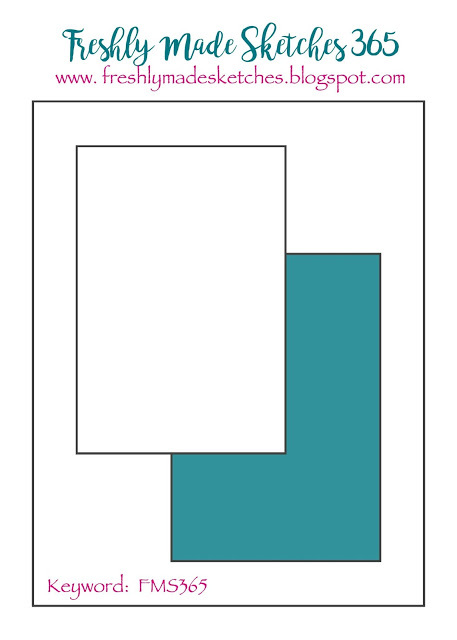 PAPER: White (PTI); X-Press It Blending Card. DIES: Stitched Rays Cover Panel, Hello and Thanks Label, Christmas Candles, Bitty Banners - all by Reverse Confetti. This card will be mailed to a close friend and former coworker (nurse) who gifted me with a visit and a Willow Tree angel following my mastectomy surgery on Wednesday. It's a beautiful symbol and will be an inspiring reminder of the many prayer warriors that rose to the occasion! I am having very minimal pain which was initially managed with just regular Tylenol! Two days postop today and I haven't needed anything for pain! Yay! 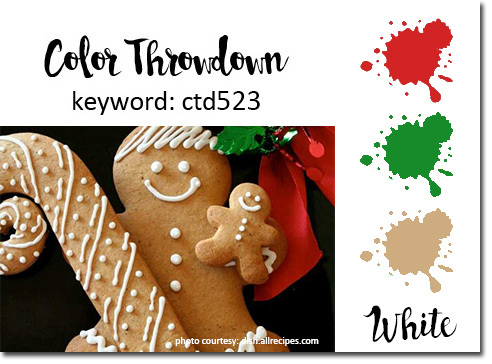 This is the last Color Throwdown Challenge of 2018! We'll take a 2 week break and then resume with new colors in 2019. 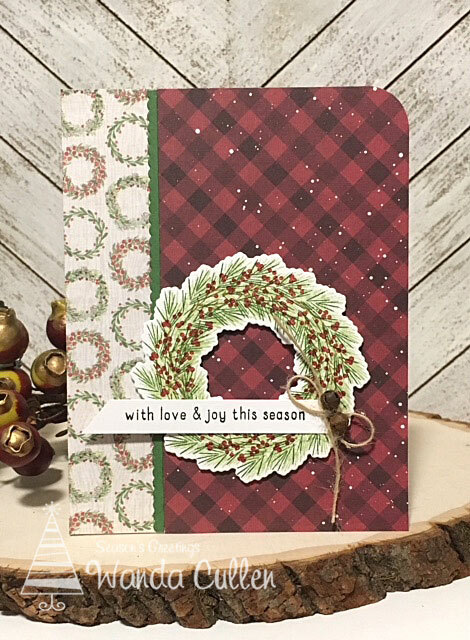 Broni is hosting this one and I went with a rustic feel using this fun layered wreath set by WPlus9 called Woodland Wreaths. 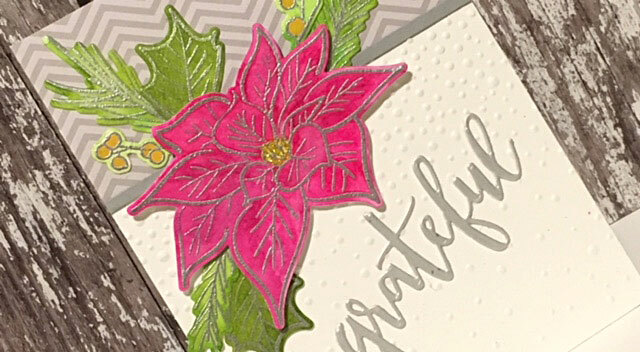 The card base was die cut with Reverse Confetti's Stitched Rays Cover Panel (love the added texture it gives to a card!). The patterned papers are from Craft Smith's "Say Freeze" 6x6 pad. I strung a couple of rusty jingle bells on jute twine and tied it into a bow then adhered it with tiny glue dots. 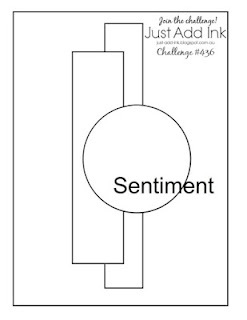 The sentiment is from Reverse Confetti's Triangle Trees stamp set. INK: Certainly Celery, Garden Green, Baked Brown Sugar, Riding Hood Red - all by Stampin' Up. 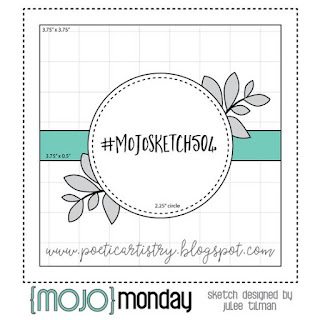 I used the sketch for the Just Add Ink Challenge that has closed for this particular layout, but I still wanted to acknowledge it. 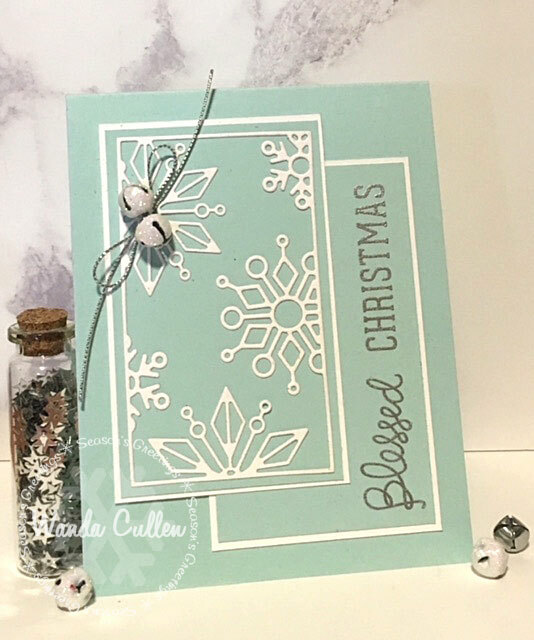 December is here already and I've got a pretty simple, white on white layered Christmas scene using some fun dies by Stampin' Up - inspired by the fun sleigh scene for the Fusion Card Challenge! I couldn't fit the sketch in with these dies so had to forego that option this time. I pulled the scrap of blue cardstock from my leftover pile, so am not sure of the color. 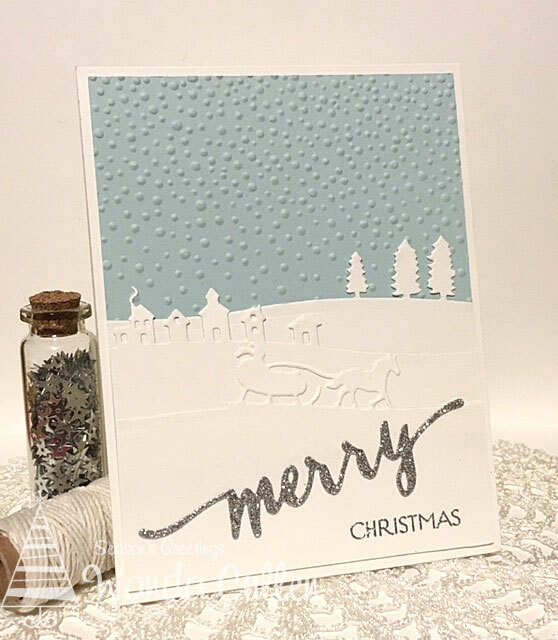 I dry embossed it with SU's Softly Falling Textured Impression embossing folder. The scene was created with SU's Sleigh Ride Edgelits Dies. 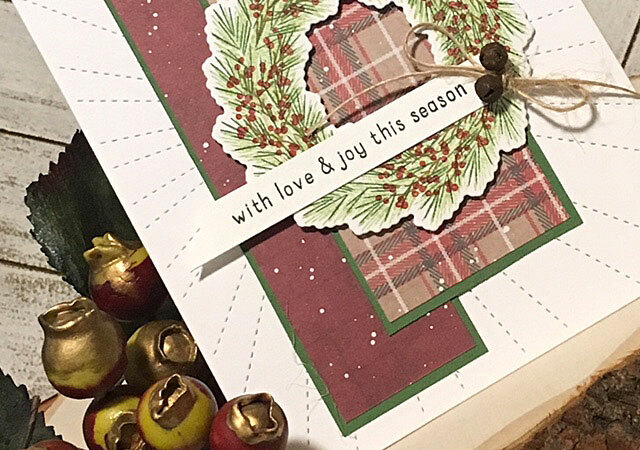 The sentiment is from WPlus's Hand Lettered Holiday stamp set with matching word die. Hello again! It's time for a festive new group of colors for the Color Throwdown Challenge! Barbara is our hostess this week and has chosen salmon, red, green and gray. 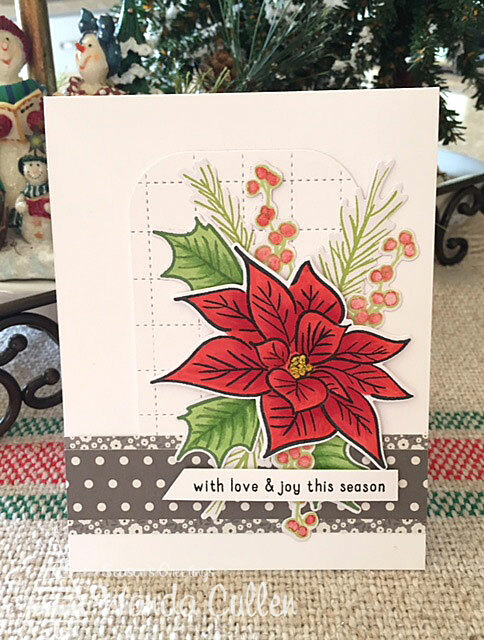 I knew right away I wanted to use Altenew's Poinsettia and Pine stamp set and paired it with a sentiment from Reverse Confetti's Triangle Trees set. Once again, I'm using this fabulous new Grid Stitched Tag die by RC and hopefully it's in stock now if you are interested. The patterned papers are from Pebbles "Cottage Living" 6x6" pad. The images were stamped on X-Press It Blending Card and colored with Copics with the exception of the berries. 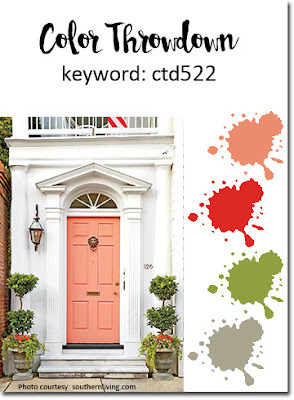 They were colored in using an Aquapainter and Coral ink by Reverse Confetti. I added yellow Stickles to the center of the poinsettia. 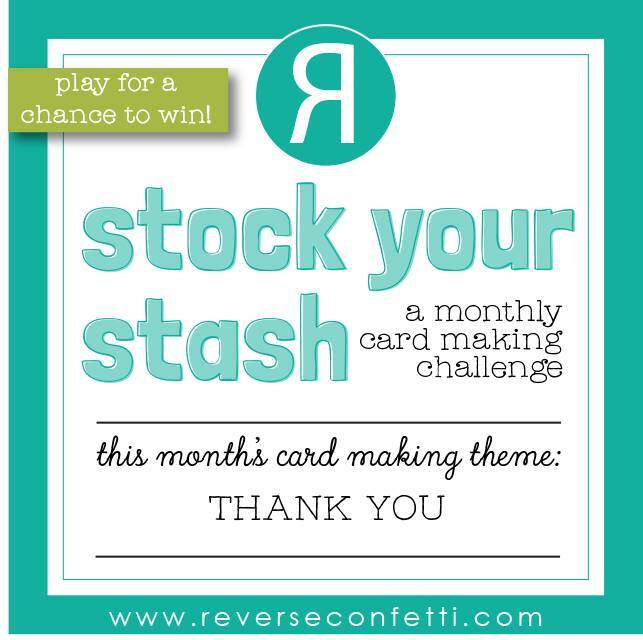 We're thrilled to have Davina Cantrell from Popsiclesticks Creates join us as our guest designer this month! 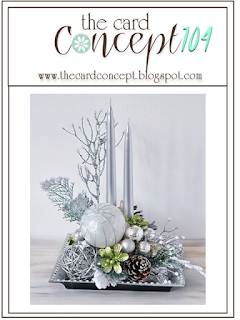 Be sure to stop by her blog and check out her beautiful creation! 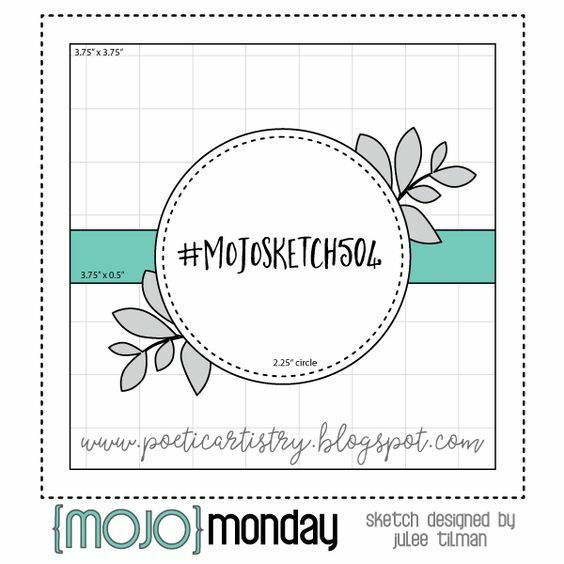 It's so good to have the Mojo Monday Sketch Challenge back...even if it's every two weeks instead of every week! Julee has a simple layout that can be dressed up or down as you wish. 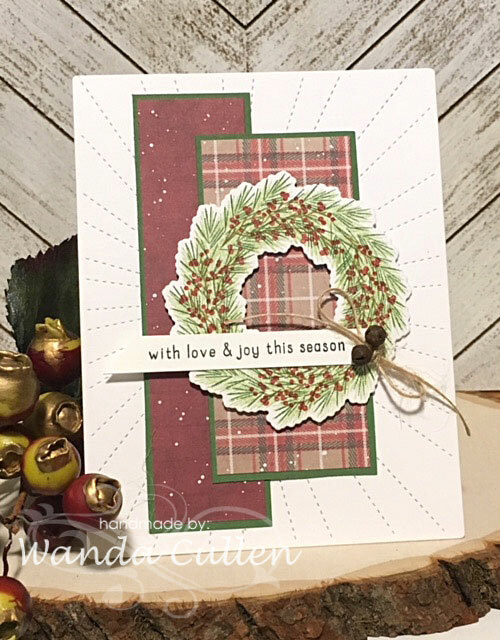 I was in a "smooshing" mood and created the background with three distress inks: Bundled Sage, Shabby Shutters, Evergreen Bough. I pounced the inks on acrylic blocks then sprayed with water. I then smooshed some watercolor cardstock (I like Ranger's 4 14" x 5 1/2" precut size) randomly over the blocks. You'll never get two pieces alike - lol! 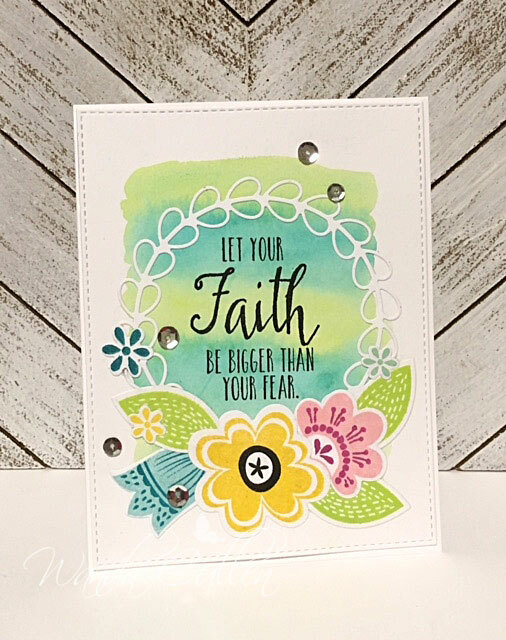 I love these "skinny" sentiments that Jen has in her Reverse Confetti "Triangle Trees" stamp set! I've used this one more than any other Christmas sentiment this year since it's so easy to add to a card without covering up much in the background. STAMPS: Triangle Trees (Reverse Confetti). 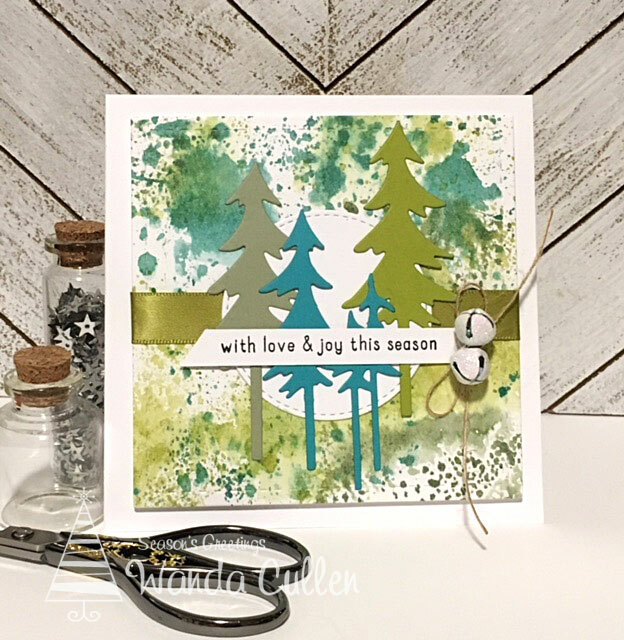 DIES: Stitched Squares (Lil Inker Designs), Stitched Circles Die-Namics (My Favorite Things), Tall Pine Trees (Frantic Stamper). 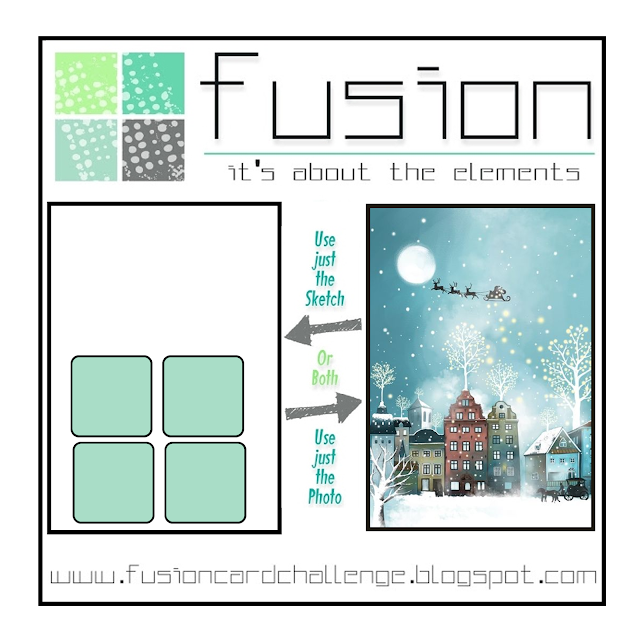 The current Freshly Made Sketches challenge was perfect to use this intricate Snowflake Block die from Simon Says Stamp. 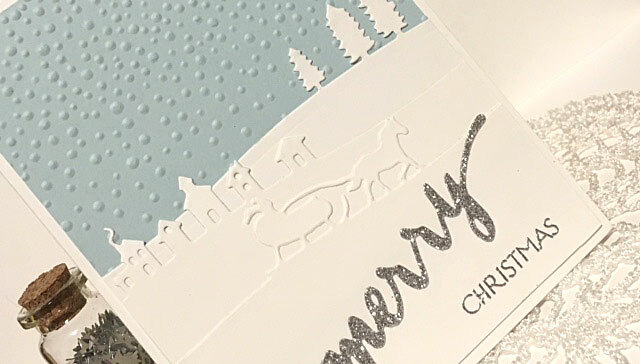 The sentiment was silver embossed (SU) and is from a SSS set called Holiday Hellos. The white frosted jingle bells and silver cording were adhered using mini glue dots. 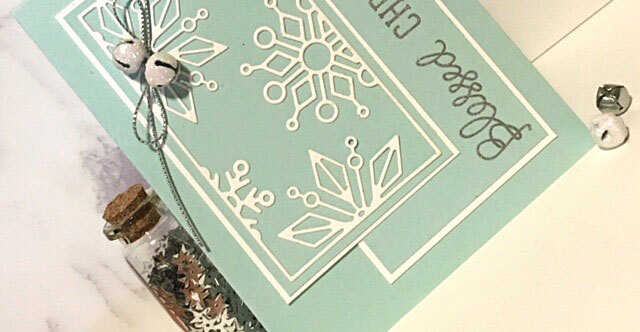 These embellishments will make the card a hand delivered option vs mailing it. Thanks so much for stopping by! Hopefully my Christmas card stash is nearing completion - lol! 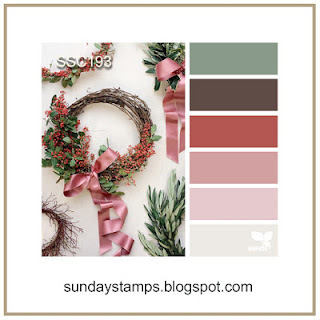 The Sunday Stamps Challenge has some beautiful colors for us this week! I used the first 3 colors posted on the swatch. This layered wreath set - Woodland Wreaths - from WPlus9 is a fun set of images to play with! I embellished with some rusty jingle bells and jute twine. STAMPS: Woodland Wreaths (WPlus9), Triangle Trees (Reverse Confetti). PAPER: Say Freeze 6x6 pad by Craft Smith; Garden Green (SU); White (PTI). INK: Certainly Celery, Garden Green, Baked Brown Sugar, Riding Hood Red - SU; Versafine Onyx Black. 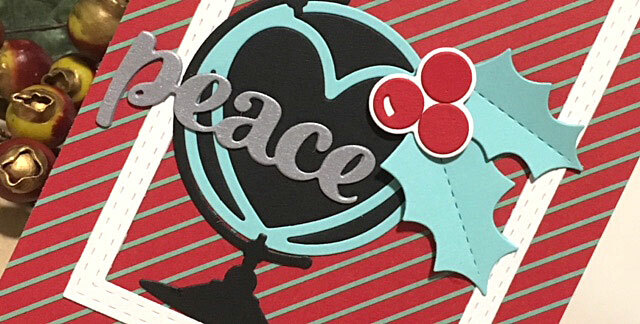 DIES: Edge Essentials (Reverse Confetti), Woodland Wreaths (WPlus9). It's been a mild and very warm day here in VA! I could take this weather every day all winter long...but that's only wishful thinking.